"Woodblock Print - Doi Hanga Collection"
"Catalogue of Japanese Colour Prints, Illustrated Books, Etc." Kyoto Hanga-In and Shinagawa were publishers for many of the Kyoto-based woodblock print artists, including Bakufu Ohno, Mamoru Hiyoshi, Sanzo Wada, Gihachiro Okuyama, and Tomikichiro Tokuriki. Collectors of their prints would have realized that, while official print titles do exist, in many cases titles were not printed on the prints themselves. As a result, the woodblock print community (including both collectors as well as galleries) has often applied 'unofficial' titles to prints in a haphazard way. Fortunately access to official print titles does exist via the woodblock print catalogues issued by Kyoto Hanga-In and Shinagawa. 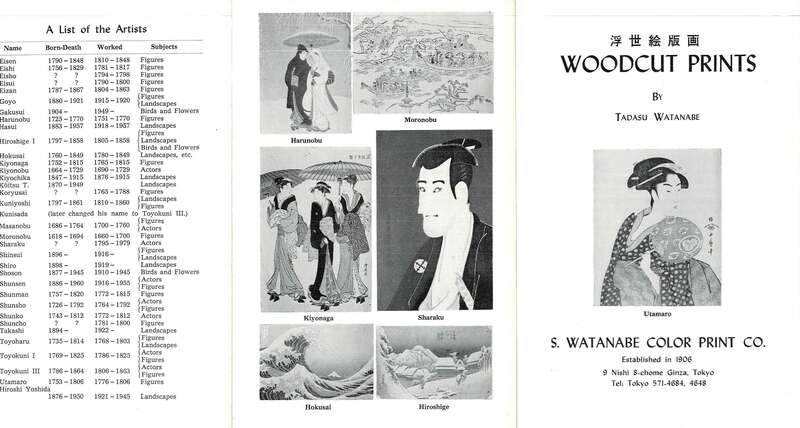 At least eight such catalogues have been published, but to date examples of only four catalogues have surfaced among the woodblock print community. These four are listed below as catalogues [A], [B], [C], and . 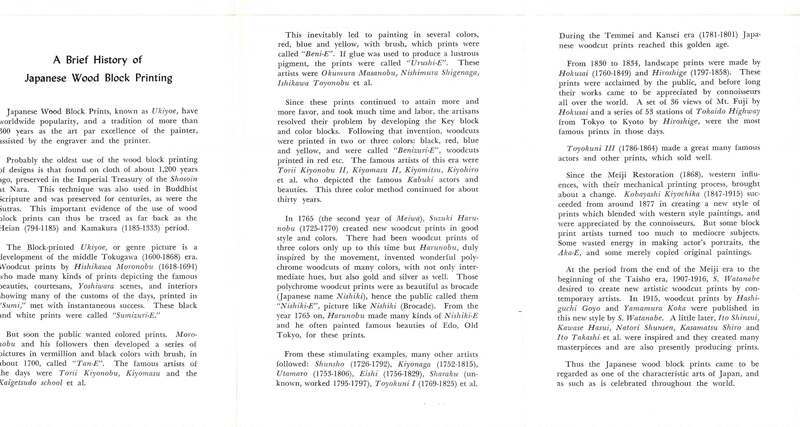 The format and content of each catalogue are generally the same, beginning with quite a lot of information regarding Kyoto Hanga-In and its founders, and the history of woodblock prints and their making. This is then followed by a selection of prints by various artists being offered by Kyoto Hanga-In. The catalogues also list other prints and print series that are not illustrated pictorially. The exact years of publication for the first three catalogues remain unknown because most of the catalogues carry no indication of publication date. After comparing the first three catalogues, I believe catalogue [A] is the earliest edition, followed by [B] and then [C]. The smallest catalogue by page count [A] lists only one address in Kyoto, while catalogue [B] lists two addresses in Kyoto. 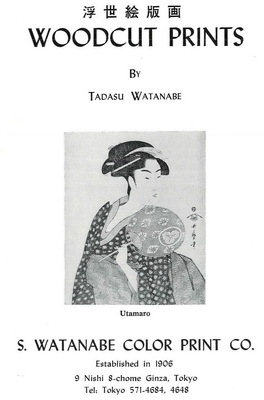 It would appear that, at the time of production of these two catalogues Kyoto Hanga-In had not yet established their Tokyo office (which occurred in March, 1953). Furthermore, both catalogues [A] and [B] show the prints "Night Scene Of Water Mill" and "Night Scene Of Farm House", which were both 'first-editioned' in 1952. This narrows down the age of these two catalogues to sometime between 1952 and February 1953. Catalogue [C] lists Kyoto Hanga-In's Tokyo office address, and it carries a note on page 12 mentioning a date of January 1954 in the future tense, so I assume that it is a later printing than [A] and [B], printed between March 1953 and January 1954. Update June 2006: catalogue [C] contains the print "Cormorant Fishing (Ships)" by Mamoru Hiyoshi, and "Shepherd" by Sanzo Wada. I've just determined both these prints were first published in August 1953, thus we can now safely date catalogue [C] to between August 1953 and January 1954. Catalogue  carries a note in Japanese that it is the 8th catalogue edition and was published in October 1963 as a special edition for the 1964 Tokyo Olympics. Of greatest surprise to me was my finding of three Tsuchiya Koitsu prints by the publisher Baba Nobuhiko listed in this catalogue. Could it be that Baba Nobuhiko sold his printing business and/or woodblocks to Kyoto Hanga-In? Hopefully in time the other four missing catalogues will be found by print collectors and will reveal further details of Kyoto Hanga-In's operations. I hope you find the display of these catalogues both interesting and helpful. Special thanks to Marc Kahn of Shotei.com and Fran Walker for allowing me to display images of their three catalogues here. Please remember that the copyright of all images displayed here remains that of Kyoto Hanga-In or its successor.